Embrace the warmth of their everlasting love with our beautiful Everlasting Love Embroidered Sherpa Blanket. To commemorate the happy couple's years of wedded bliss, we custom embroider their years together along with their first names and current anniversary year in your choice of multiple thread colors. 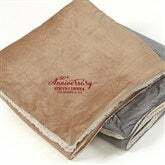 Choose from 2 blanket colors, grey or tan, and 2 sizes, 50x60 or 60x72. Perfect for outdoor activities, or for curling up at home with a good book, a good friend, or that special someone!